The Athenix Institute was created to ensure you have a safe, discreet and professional cosmetic and plastic surgery experience. All of our procedures are performed onsite in our fully accredited or licensed, state-of-the art, cosmetic and plastic surgery centers. Our California centers facilities are accredited by the Institute for Medical Quality (IMQ) as required by the State Medical Board of California. 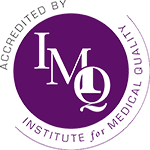 The Institute for Medical Quality Certificate of Accreditation is a sign that an organization has committed to providing high-quality care and that it has demonstrated its commitment by achieving IMQ Standards. The accreditation process involves thorough on-site review and regular inspection by the IMQ expert surveyors, who are themselves, health care professionals. We use the most advanced, state-of-the-art instrumentation, equipment and monitoring devices to ensure your safety. Our modern cosmetic and plastic surgery centers have all been built within the past three years. And we strive to provide you a relaxing, private experience from the reception area and consultation rooms to the operating suites.